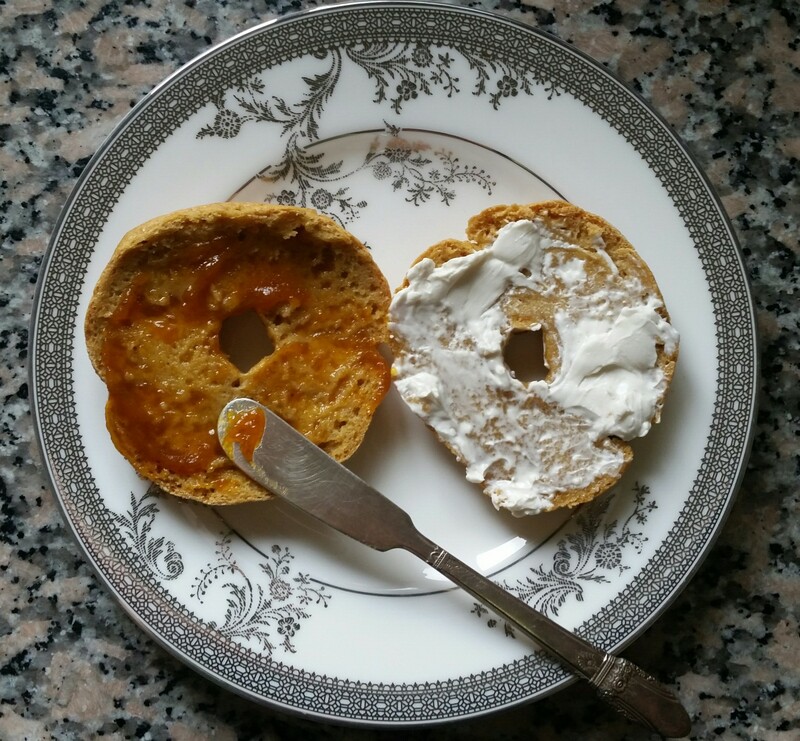 Well, here is my 1st gluten free bagel attempt! 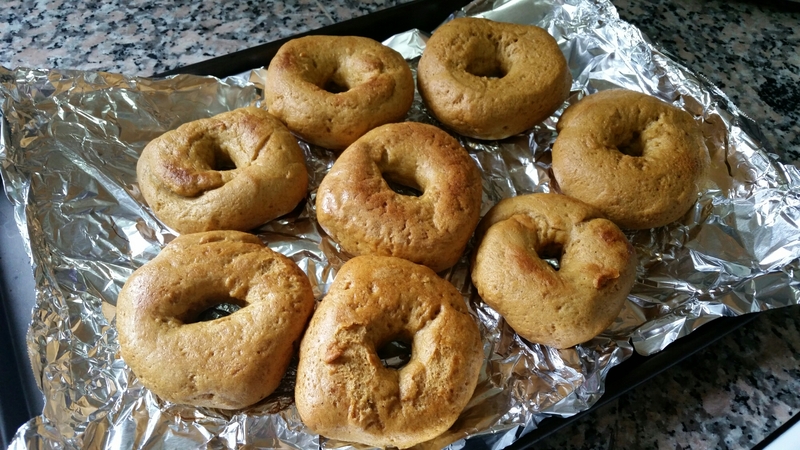 I decided to go with pumpkin bagels, because it is after all October. 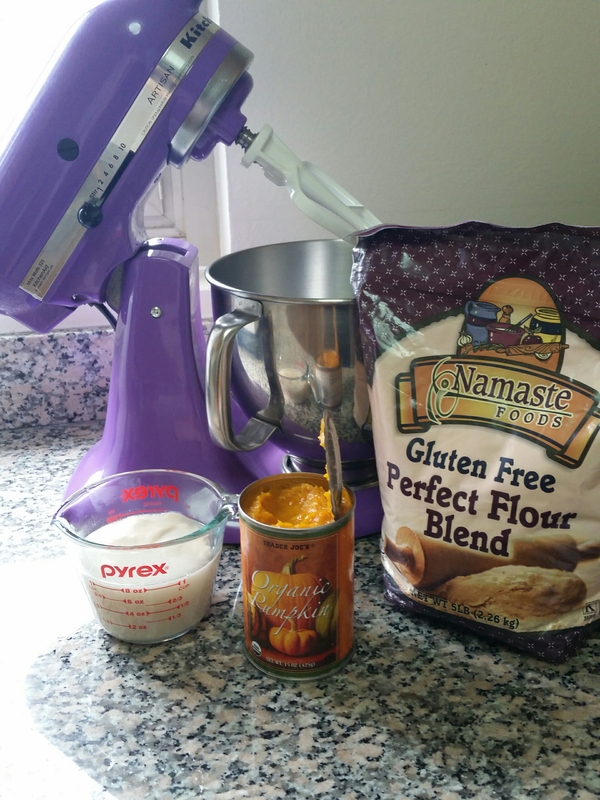 I ended up adapting this recipe from Lemon-Sugar.com, with the new Namaste Foods Gluten Free Perfect Flour Blend I picked up this week. I selected it on recommendation from a friend after reading a bunch of gluten free blogs, and seeing that everyone seemed to have their own custom blend. This was pretty darn close to the one I was going to mix up myself based on Fork and Beans’ recipe, and you’re supposed to be able to sub it 1:1 in regular recipes. 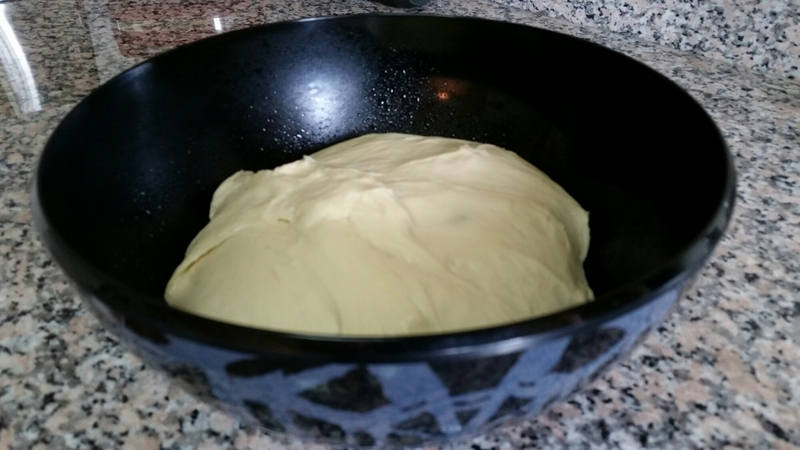 Yeast proofed, yet again! 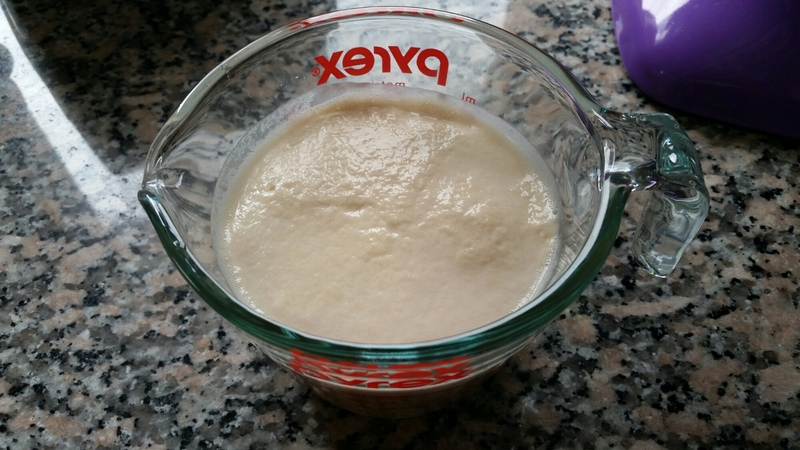 I am now a yeast proofing master. I tweaked the order a little to save a bowl. 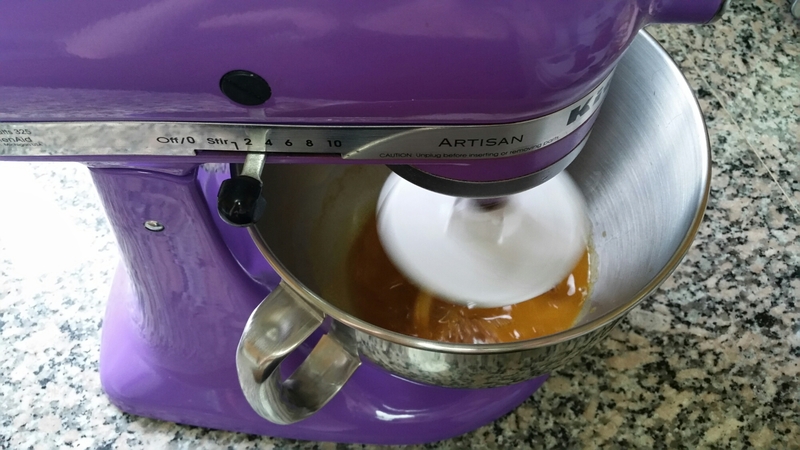 I poured in the yeast & water mixture, then added the pumpkin, and then the spices. 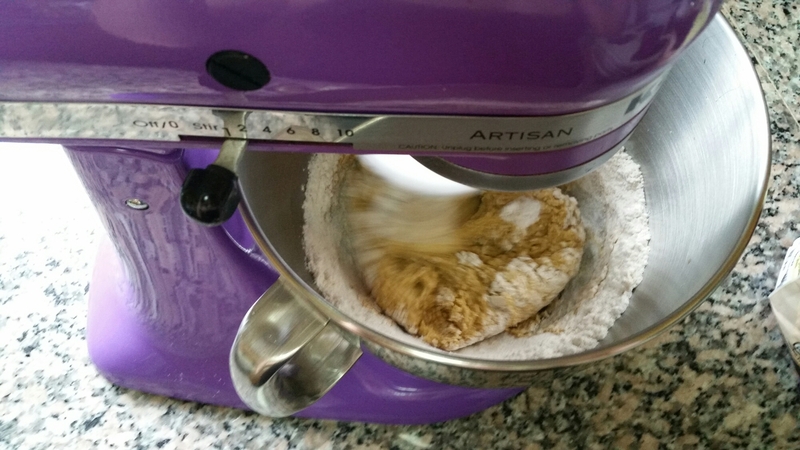 I then added the flour in 3 – 1 cup additions. 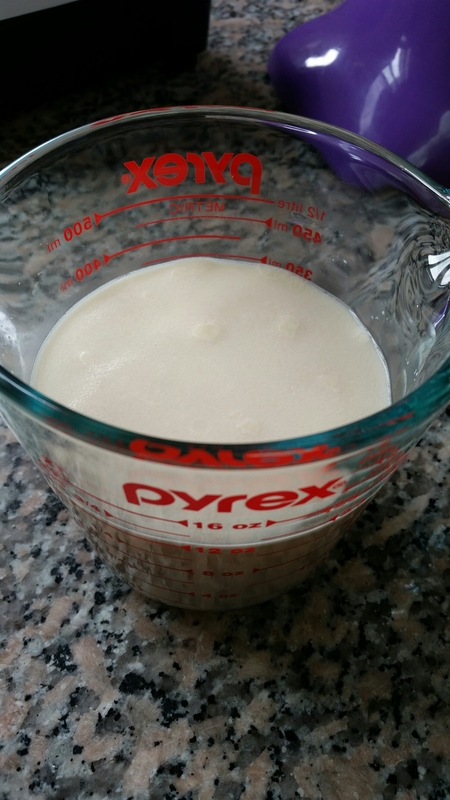 My dough was definitely too sticky after the 3 cups, and it say you might need to add 1-2 tablespoons of extra flour. I ended up adding 4. 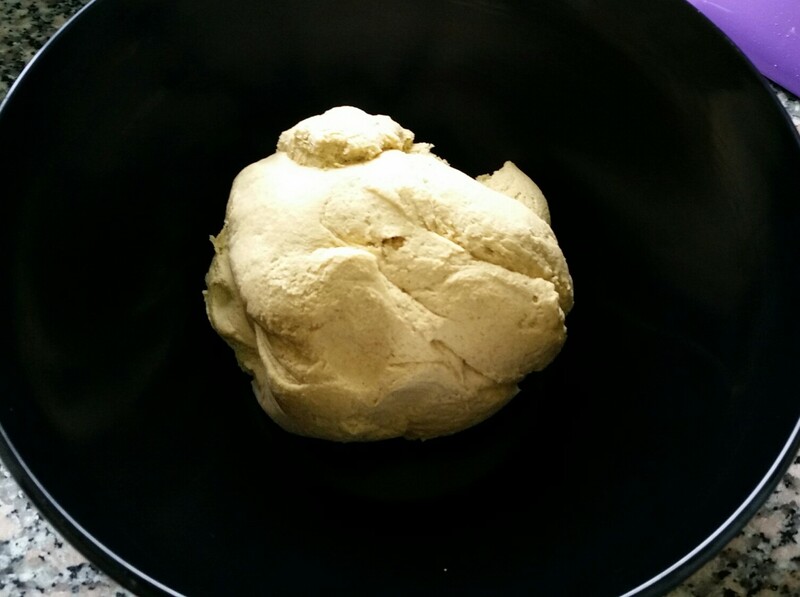 I really wasn’t sure if it was going to rise, given the GF flour and all, but left it to do its thing for an hour. While it did do some rising, it definitely didn’t double in size. 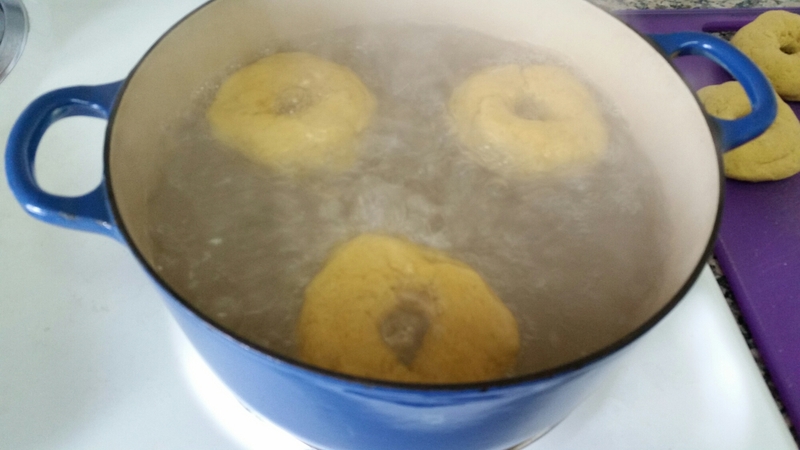 After forming the bagels, the recipe had another step to leave them to rise a little for an extra 30 minutes, but since not too much happened in an hour, I decided to skip it and go straight for the boiling. The recipe also had you bake them for 5 minutes and then flip them. As an experiment I did 3 that way. A few about 20 minutes in, and the last 3 I just left alone. There wasn’t a tremendous difference in any of the the 3 sets, though the 1st 2 did look more evenly golden. I sliced one and found that they were extremely hard on the outside and just a touch under on the cook on the inside, so I tossed them back in the oven for another 5 minutes. This recipe called for them to baked at 400*F for 30-35 minutes, but I’d probably try a lower temp and longer cook time for future attempts to avoid the texture issues. 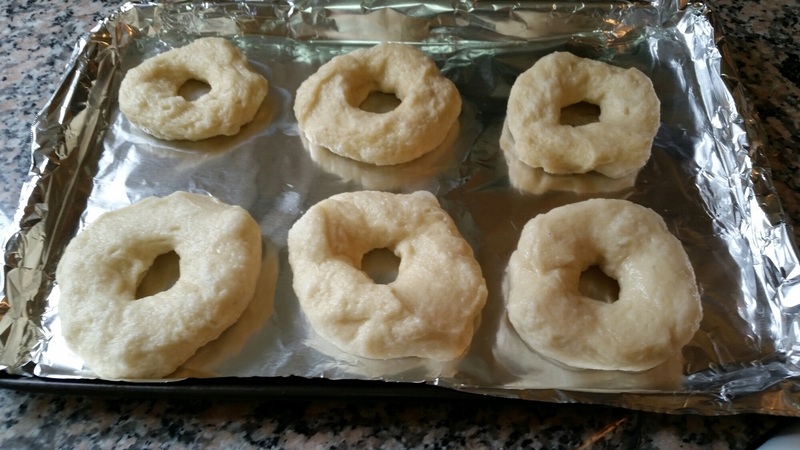 I was also wondering if maybe I should have let them rise a 2nd time to get them a little more airy and less dense? Regardless, they still tasted good, especially with pumpkin butter! 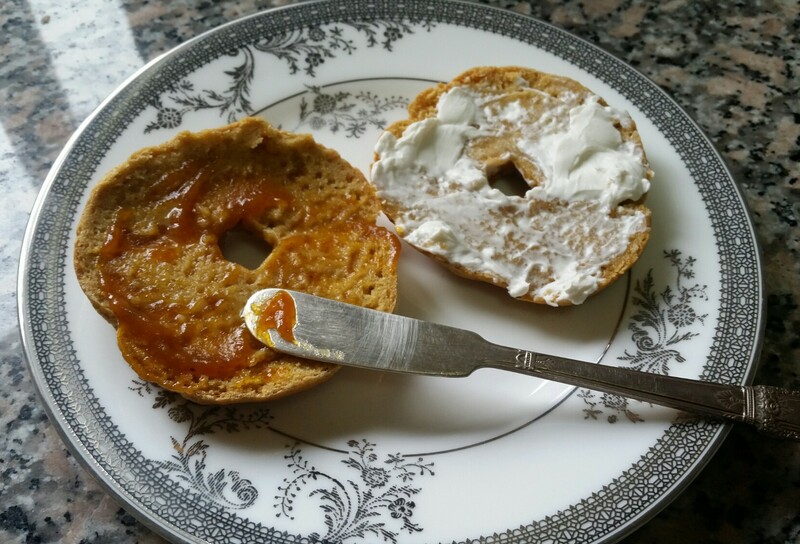 This pumpkin butter from Trader Joe’s is magical stuff btw, mixed with butter, mixed with cream cheese, by itself, even mixed with peanut butter – which is how I ate my bagel this morning! 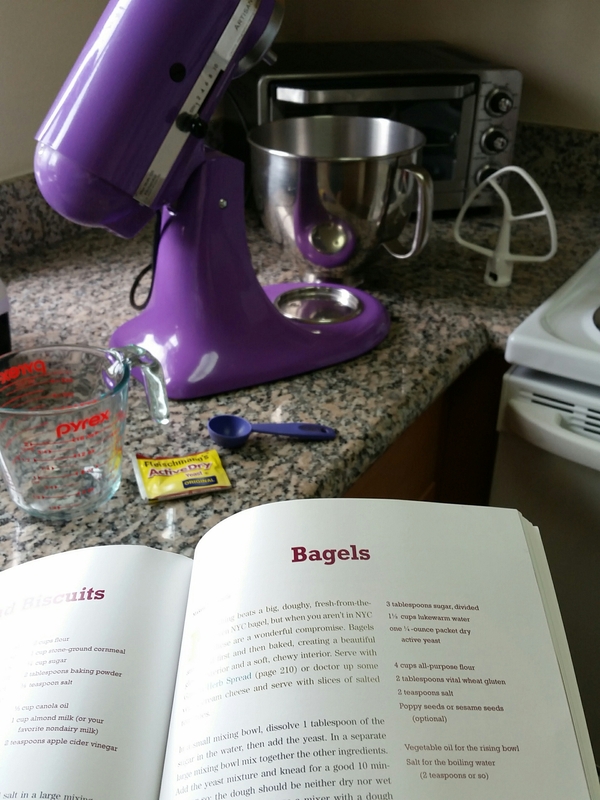 In general in my gluten free baking so far, I’ve found that I need longer cook times than expected. Thomas also made some chicken (tofu) and waffles last night and found the same thing. He needed to lower the temp on the iron and cook a little longer in order to avoid the uneven cook. Other than that, you’d never know by the taste of either that they’re gluten free! As always, thanks for reading! More to come soon. 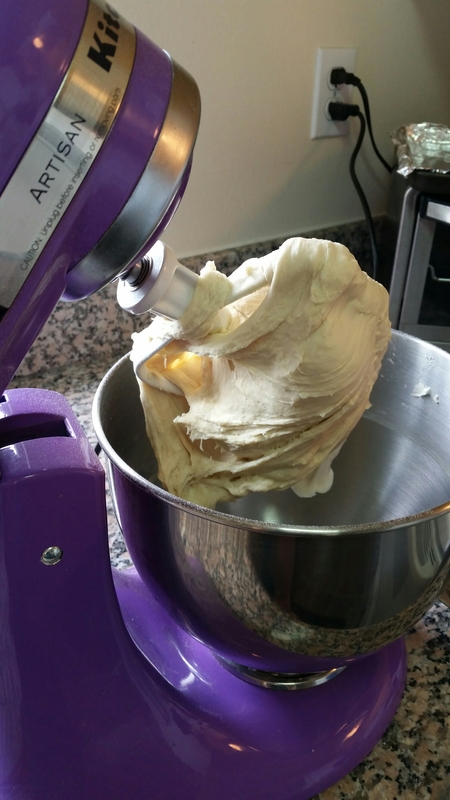 First, there are so many things that I want to tell you about, including this post from July! JULY! That’s right. 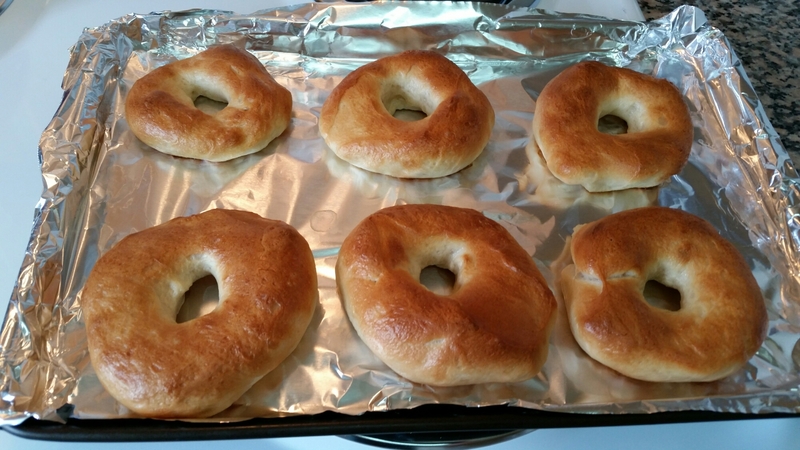 BAGELS! 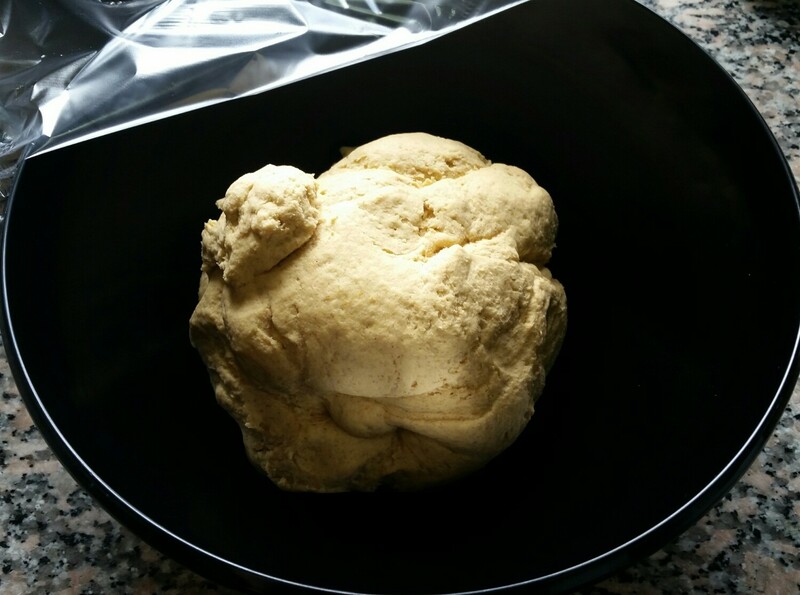 How I conquered my fears of yeast bread! I used Isa’s Vegan Brunch recipe. The happiest thing to see! 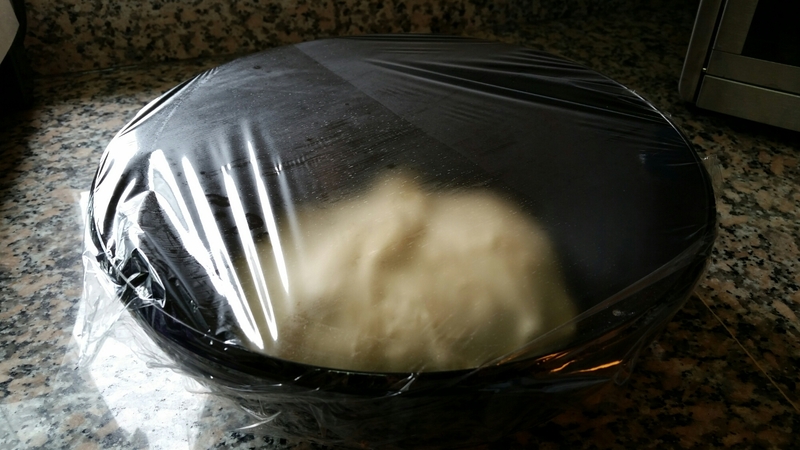 I can’t tell you how many times in my younger years, I failed to make this happen, thus perpetuating my irrational fear of yeast breads up until this! 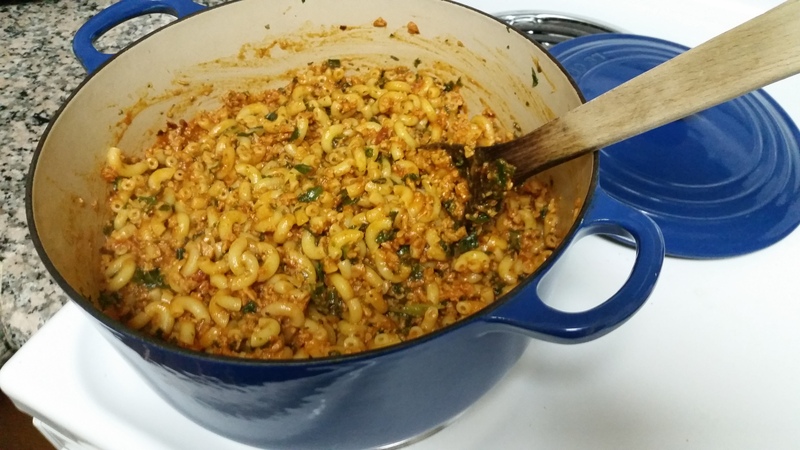 This is barely a recipe, but a tasty, cheap, fast way to get dinner on the table in the time it takes to boil and cook the pasta of your choice. The secret? Our good friend T.V.P.! We hadn’t bought some in a long time, but luckily I remembered we had picked some up on our last shopping trip. I grabbed the TVP* out of the cupboard, along with a jar of pasta sauce and some elbows, and then proceeded to look up my recipes over at veganderbycatparty.com. I didn’t even bother to get as fancy as this, but made it in the quickest, easiest, and cheapest way possible. Instructions below! *Want more ideas of what to do with TVP? 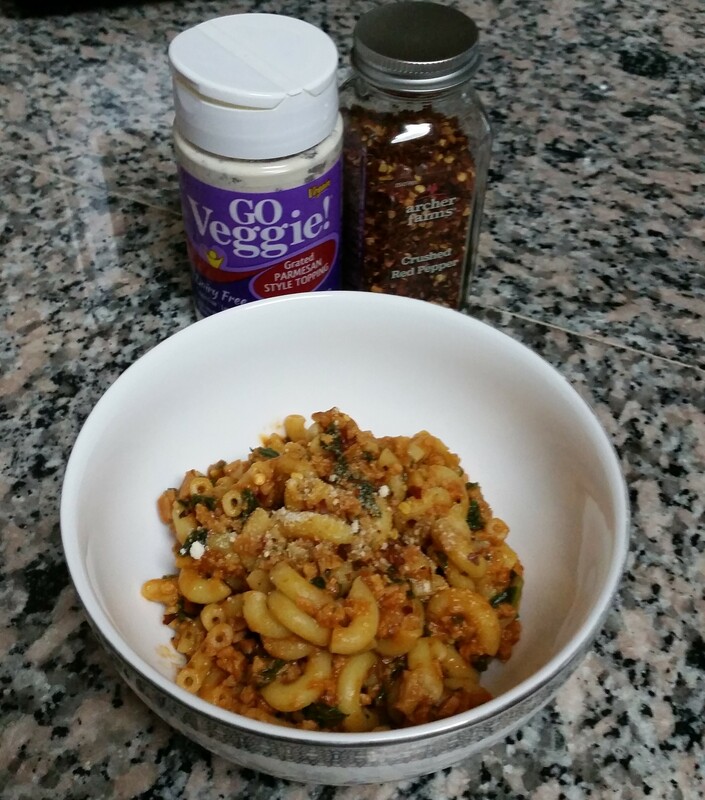 I wrote a blog post about that here: How to make TVP / vegan ground meat substitute in 5 minutes! 2 tsp. Bragg’s liquid aminos / soy sauce / etc. 1. Put pasta water to boil. Cook pasta according to box directions. 2. Meanwhile, in a saucepan, combine water, liquid smoke, worcestershire, and Bragg’s, and bring up to a boil. Turn off heat and add TVP. Stir until water is absorbed. Add jarred pasta sauce and seasonings, and stir until well combined. 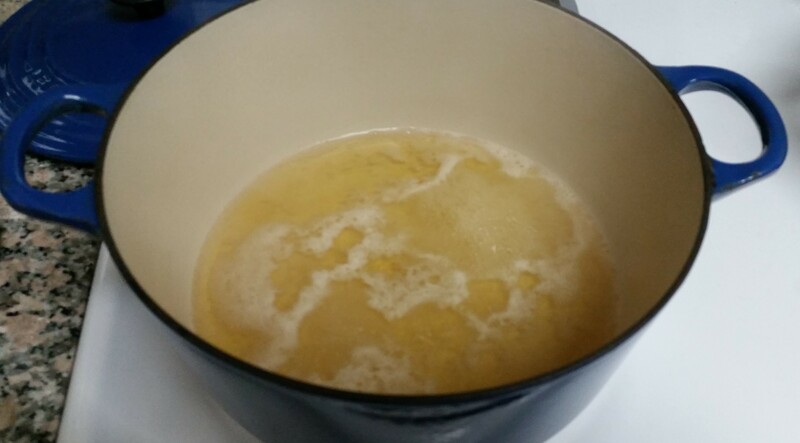 Raise heat until mixture bubbles, and cover to simmer while the pasta finishes cooking. 3. 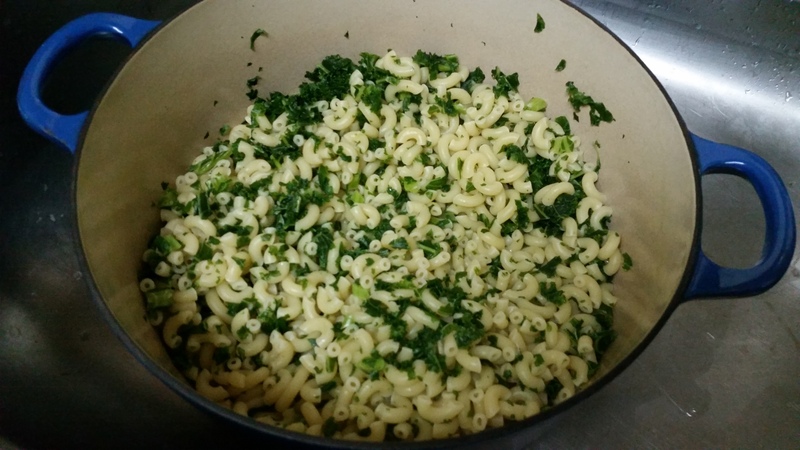 At the last 1-2 minutes of pasta cooking, add frozen greens or veggies (if using), and strain when done. 4. Shut off heat on sauce. 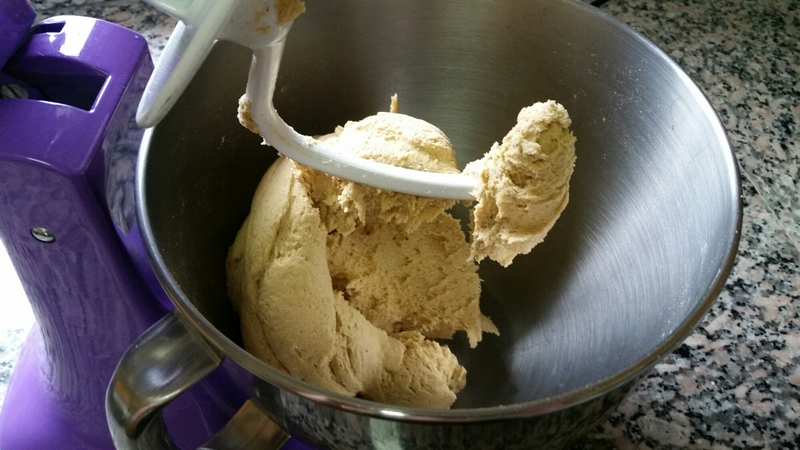 Stir in nutritional yeast (if using), and adjust seasonings if necessary. You’re done, and that took no knife work, and only 8-15 minutes, depending on what pasta you used! Some Nooch for good measure! 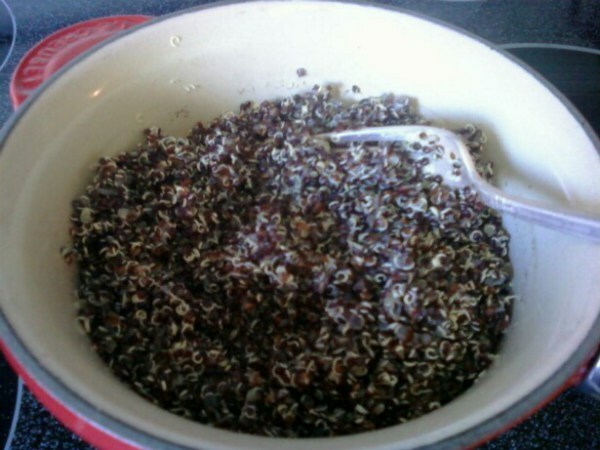 How to Cook Black Quinoa! One day at Whole Foods, I was looking around the bin section and found this black quinoa. It looked a whole heck of a lot like red quinoa, but I thought I’d give it a try and see if the taste was much different. It was a little toastier tasting, where I think the red quinoa has a slightly savory flavor compared with the plain. 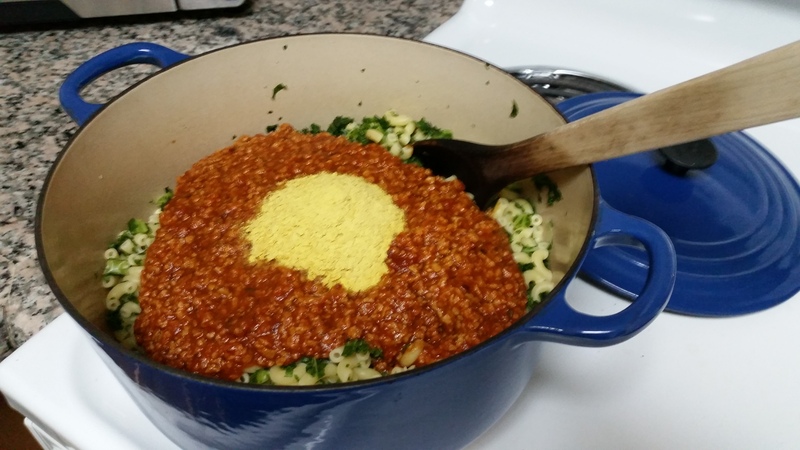 It cooked in the same time as red quinoa, which was 20 minutes (I find that regular quinoa cooks in 15). I used 1 cup of wet, rinsed quinoa and 1 3/4 cups of filtered water. For more flavor, feel free to use veggie broth instead of water or throw a vegan bouillon cube in with everything! 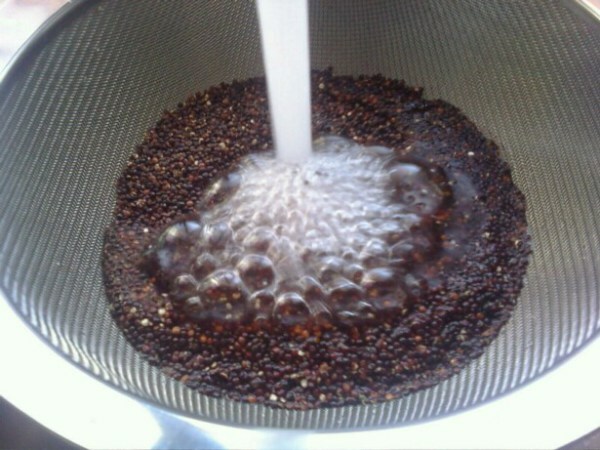 1.First you’ll need to rinse the quinoa in a fine mesh strainer to remove the saponin (that causes bitterness). 2. 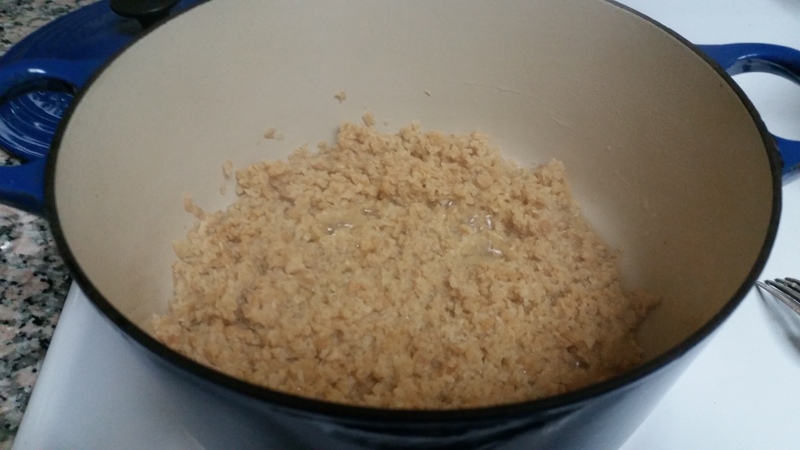 Bring quinoa, water and salt up to a boil, and boil for about 2 minutes. 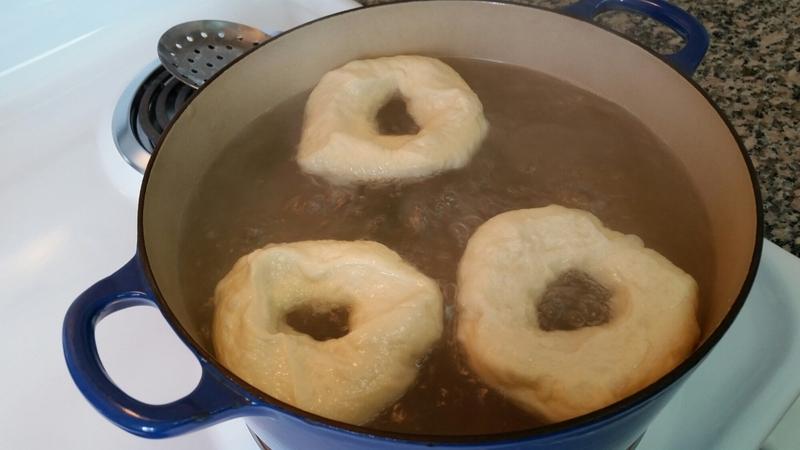 Drop heat to low, cover, and simmer for 20 minutes, or until all water is absorbed. 3. Fluff with a fork and enjoy! First you’ll need to rinse it off. I mean, commercially they rinse it for you, but it’ll still be a little more bitter if you don’t. 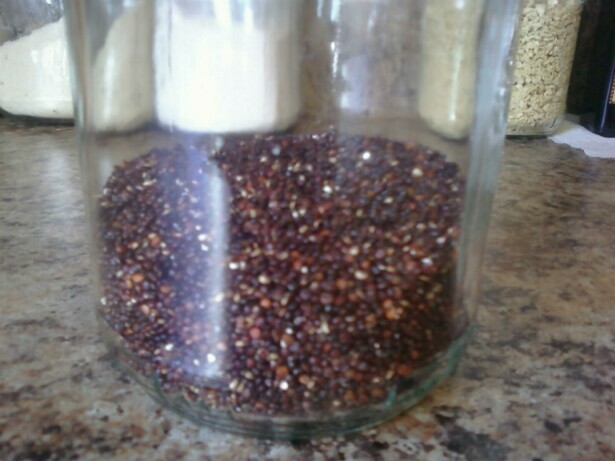 I often don’t rinse regular quinoa, but you probably want to with the black. Bring quinoa, water and a pinch of sea salt up to a boil. I let it boil for a minute or two before dropping down to a simmer. 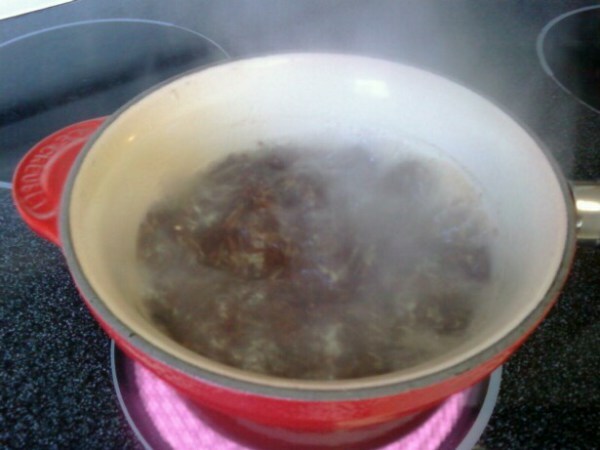 Cover and simmer on low for 20 minutes, or until water is absorbed and fluff with a fork. Ta-da!